England recorded a 48-run Super 8 victory against Ireland, but were some way from their best form in Guyana. 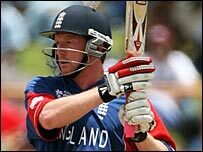 Paul Collingwood struck three sixes in an assured 90, sharing 81 with Andrew Flintoff (43) after Kevin Pietersen fired a rapid 48 in England's 266-7. In pursuit of 267, Ireland lost Jeremy Bray in the opening over but Niall O'Brien made a gritty 63 from 88 balls. Monty Panesar and Michael Vaughan piled pressure on but late runs were conceded until Flintoff wrapped it up with 4-43. For all their dominance, England still had moments of expensive ineptitude with both bat and ball, making heavy weather of sealing the win having appeared to have taken a stranglehold. After sending a delivery two yards down the leg-side, the unpredictable James Anderson gave them an important early wicket. Bray, who made an unbeaten 115 in the opening match against Zimbabwe, slashed to point where Ravi Bopara took a slick low catch. Sajid Mahmood bowled an accurate opening spell but it was his agility in the field that produced the next wicket, a flick from the back of the hand scoring a direct hit to leave Eoin Morgan short of his ground. There were three slips and a gully at that stage but O'Brien shared 61 with William Porterfield, Flintoff's first three overs costing 20. The all-rounder returned to force Porterfield into a leading edge and the run-rate began to climb steadily. Ed Joyce capped a forgettable performance by spilling a routine chance at mid-wicket when O'Brien was only nine and the pugnacious left-hander went on to his third ODI fifty, from 66 balls. Panesar was introduced after 21 overs with the rate over six, and he was partnered by Vaughan, the first time the captain has bowled in an ODI since one over went for 13 against Australia in June 2005. In 19 consecutive overs of spin there were only two boundaries and Vaughan picked up the key wicket of O'Brien with a delightfully flighted slow delivery that left Paul Nixon with an eternity to remove the bails. There was time for some lusty late boundaries as the England seamers failed to find the right areas, Trent Johnston hitting the biggest six of the day. Flintoff finally found the decisive full-length deliveries that snared the last three wickets. Ireland-born opener Joyce departed in ignominious fashion against his old team, offering no shot to Boyd Rankin's first ball and seeing his off-stump fly out of the ground as the ball seamed back. Vaughan's critics found more ammunition when the skipper, having clipped a sumptous vintage boundary in the opening over, edged tamely to the keeper. Rankin claimed 2-5 from his first three overs but he suffered from cramp and was only able to bowl another four, which proved costly in the latter stages. 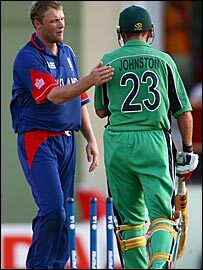 After the 50 came up in the 11th over, Johnston brought himself into the attack but Pietersen smashed three fours in his opening over. The second powerplay brought 28 runs, but in the final five over segment only 12 were scored. Ian Bell once again fell between the devil and the deep blue sea, making a patient 31 but failing to produce the major innings expected. He departed in Kevin O'Brien's opening over when he tried to late cut but merely deflected into the keeper's gloves. Pietersen tried to dominate the innocuous looking spinner Kyle McCallan but was smartly caught at mid-wicket. 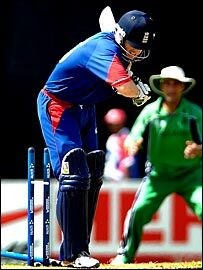 Given his recent problems, there was much attention on Flintoff, who immediately looked in good touch. He began in sublime fashion with a defensive push first ball that raced between the cover fielders to the boundary. Yet again Collingwood was the ideal foil, confidently pushing through the covers to the boundary early in his innings, and recording the fifty stand from 66 balls with Flintoff with a deft sweep off Botha. Flintoff managed to contain his wild attacking instincts, but in the 44th over succumbed to a slower off-break from Johnston that bowled him via an inside edge. Collingwood gave himself room to launch Botha over mid-wicket, where he was smartly caught by a spectator in the first row. More deft footwork resulted in another sweep over backward square for four and a second six just cleared long-on. Nixon, who was reprieved when replays of a catch in the deep proved inconclusive, hit a short arm jab over long-on for six in a cameo 19. Having launched his third legside maximum, Collingwood needed 12 from the final over to reach his century but was run-out by an alert bowler Johnston at the stumps looking for a quick single third ball. However, Bopara struck a glorious straight drive to the boundary as 65 came from final five overs to ensure there were more than enough runs in the bank.